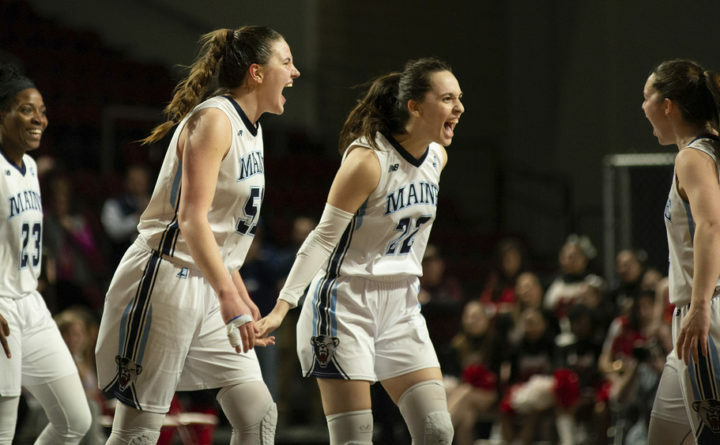 Maine players celebrate in the last minute of an NCAA college basketball game against Hartford for the America East women's tournament championship Friday, March 15, 2019, in Bangor, Maine. Maine won 68-48. 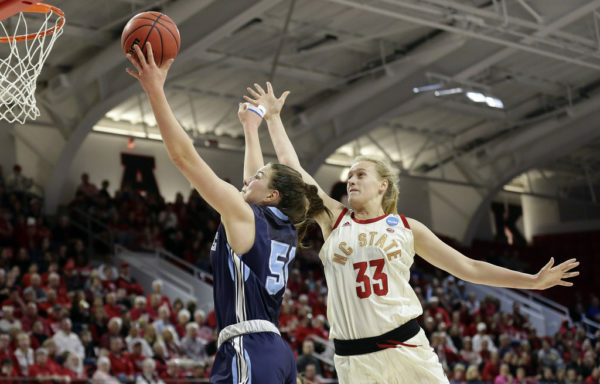 Follow along as the University of Maine women’s basketball team faces off against North Carolina State in the first round of the NCAA tournament. No. 14 seed UMaine challenges third seed NC State at Valvano Arena in Reynolds Coliseum in Raleigh, North Carolina. The game is scheduled to begin at 1 p.m. Saturday, March 23. Keep up with all the action here. No. 6 seed Kentucky beats No. 11 seed Princeton 82-77 in the first game at Raleigh. UMaine and North Carolina State should tip at approximately 1:27 p.m.
NC State leading UMaine 9-8 halfway through first period. Dor Saar has five points for UMaine. Sutton is 0-for-7 and Millan is 0-for-3. Blanca needs to attack the basket off the dribble. In fact, so does Sutton. 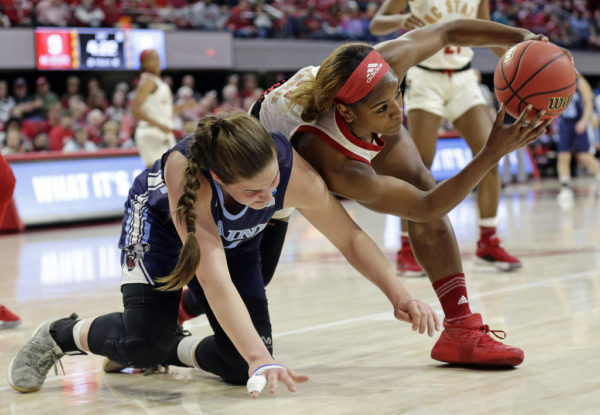 NC State lacks depth and UMaine would benefit from going to the hoop and drawing some fouls. Kai Crutchfield scores seven straight points to close out the half and give NC State 39-22 halftime lead. UMaine’s leading scorers, Blanca Millan and Tanesha Sutton, are scoreless. NC State leading 45-29 late in third quarter. Millan gets her first basket for UMaine. Six-foot-five Elissa Cunane is causing problems for the smaller Black Bears in the paint. NC State leading UMaine 51-37 after three periods. Millan has four fouls.